Alias: Feska, Koru, "That creepy ninja in the corner." Personality: Upon first glance, one would describe Koruso as a very serious, no nonsense kind of guy. 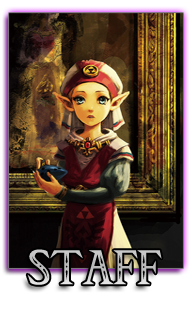 Raised in the Sheikah clan, his sole purpose in life was to serve Princess Zelda, the woman he was chosen to protect. Due to this, he is naturally very protective of those he knows, and even more so of the princess herself, never hesitating to risk his life for her sake. Though he's not stone-faced. He's fairly decent at hiding his emotions when he wants to, though he can have a sense of humor around the people he feels most comfortable with. He's also very kind and generous to the citizens of Hyrule and the other surrounding nations. He'd do what he could to help out a person in need if he didn't have more pressing matters to attend to. Koruso is also slow to anger. He never panics. And most of the time, he doesn’t let his anger cloud his judgement. After all, if he was to be the protector of the Princess, he couldn’t afford to. But in the rare event that his anger gets roused from his heart, he will not stop until he’s made whoever did it pay for whatever they did to make him angry. Even if it took him a hundred years. Likes: Princess Zelda, His hawks, the Shiekah Clan, Hyrule, animals, forests. Dislikes: Hot or humid places, foreigners, not knowing the full picture, wide open areas with no cover. Motivations: Princess Zelda - He is her protector. Her shadowy guardian. He will not allow anything to happen to her. Hyrule - He serves Hyrule as an extention of serving Princess Zelda. He will do everything he can to ensure the safety of the land, regardless of how hopeless it looks. Fears: Failing Zelda - He fears that he might not be able to protect Zelda in his current form. Losing Hyrule - He fears that if Zelda's visions come true, Hyrule will be thrown into a state of chaos. He wishes to do anything he can to prevent that. Special features: Like many members of his clan, his eyes seem to glow in the darkness, sometimes. History: Born into the Shiekah Clan within days of Princess Zelda, Koruso was chosen from birth to be her guardian. He was raised inside the castle walls along side her, and it wouldn't be uncommon to see the two spending a lot of time together. They became inseperable, having little adventures or getting into trouble occasionally. The best of friends. He had always felt a very deep rooted connection with the princess. Not just because of their intertwined destiny, or the mark on the back of her hand. Or the fact that he was a Shiekah. No, she seemed to understand him like nobody else. She was always able to read his emotions no matter how well he hid them, and she always seemed to know just what to say to cheer him up and make him feel better. Likewise, he seemed to do the same for her. That was when the first seeds of romance were planted within him, that would only blossom over their shared years together. As he grew older, the two of them changed. Due to Koruso beginning to take up duties such a monster hunting or patrolling the grounds, he didn't get to spend much time with her in his later teenage years. They still saw each other occasionally, usually when Koruso snuck out to her balcony. A trend that always got under the kings skin, but at the same time made him feel better. Koruso was totally devoted to Zelda, which is exactly what he had wanted. With the previous nursemaids disappearance, Koruso was called upon to be Zelda's new nursemaid. He accepted without hesitation, and now he spend his days serving by Zelda's side, doing whatever she needs him to do. Even if it's something as mundane as taking out the trash. RP Sample: The sun hadn't been up when Koruso awakened. He sat up in his bed, turning his head to look out the window. The sky had just turned a beautiful orange as the sun was just now beginning to rise, and Koruso chuckled to himself. An early bird at heart, Koruso enjoyed waking up to that sight every day. It was nice and relaxing. Though the feeling didn't last for long. Soon enough, Koruso was out of bed and dressed. He wore black pants and a dark blue shirt, with his knives and sword strapped to his thighs. His black cloak completed the ensemble, covering his weapons and protecting him against the elements. He looked over himself in the mirror in his room, noting the lack of armor, aside from a little chainmail he wore around his torso between two shirts. Just barely enough protection, and it got Zelda to not worry about his choice of attire so much. She always did insist that he wear proper armor. He understood why, though. With her father passing and nobody to really guide her as much, she needed someone who was capable of staying by her side. Someone she could trust. Someone that she could have hold her and have a shoulder to lean on in her moments of weakness. Everyone needed somebody like that. He turned towards the door, gripping the brass knob wit his gloved hand and pulilng it open, heading out into the halls of the castle. Being Zelda's personal attendant had it's perks, of course. His room wasn't that far away from Zelda's own quarters, and he had more or less unrestricted access to the castle. There were a few rooms he wasn't permitted to enter unless Zelda was with him of course, or unless she gave him permission to go into those rooms on his own, but he didn't mind. He didn't take this job for the benefits, even if they were nice. The real reason he'd taken it was so he could serve Zelda better. And being close to his old, dear friend made him feel better, too. Face claim: This FC is Hei from Darker Than Black.